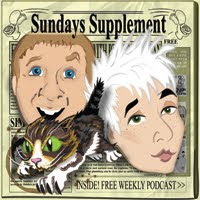 We've got ear groupies and Cilit Bang, Spike and bums, plus iszi does an Empathy Test. More geek references than you can shake a light sabre at - plus Peter Cook, Henry Kissinger and Sandi Toksvig ... in a three-way. Not really. Brace yourself for a surprise this week. January Jones goes Back to the Future, and Supergran goes dogging. Jimmy Dean's on the cover of our magazines. And Johnny Depp's giggling in the face of death.